HomeBlogCat HealthHow many litter boxes do I need? Litter boxes can be a challenge for both new and veteran cat owners alike. Not all cats will use the litter box instinctively, and must be litter trained. Not to mention, if you have more than one cat, how many litter boxes should you have, ideally? There are some general numbers to follow when it comes to cats using the litter box, and a few things about kitties that you need to keep in mind when “litter planning” for your home. The short answer: It isn’t ideal. I know a lot of you out there are going to say, “My cats share a litter box and its fine as long as you clean it!”, and your cats very well may share a litter box, and it may be just fine for them, but it might be better if they didn’t. Imagine living in a house with 3 or 4 other people and only having one bathroom. One sink on which to store all of your stuff, one shower to bathe in, one toilet to use. That’s kind of what its like for a cat to share its litter box with other cats – stressful and a hassle. 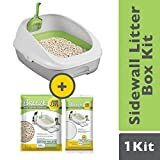 Having multiple litter boxes for your multiple cats is not only good for the cats, psychologically, it will be good for you and your house guests. The biggest complaint people have about cats is the “cat smell” because they use the bathroom indoors. This is usually only a problem when the litter wears out and stales, and is no longer able to trap or neutralize odors. The more cats you have using the same litter, the faster this happens. If you have more litter boxes available for use, they won’t be overused as quickly, and will be able to trap and eliminate odor. As long as you clean them regularly and stay on top of it all, you should see the ‘cat odor’ reduced or eliminated in your home. Cleaning that many litter boxes each day is too much! If it is cost prohibitive to buy that many litter boxes and keep them fresh, then you need to consider if you should own that many cats. If you only have the time and resources to clean one or two litter boxes each day, then you really should only have one or two cats. If you aren’t able to put in the work needed to care for 3, or 4, or 5 cats, then you don’t need them. You should also consider the size of your house when getting a pet. We, for example, only have 1,000 square feet. That’s enough for two or 3 people comfortably, and one – maybe 2 – kitties. This is a whole different article, really, but you need to consider each animal having a place they can go and be alone. They need a space to themselves. Likewise, you’ll need a place for all of the litter boxes to go. If you can’t fit 4 or more litter boxes in your house, you need to reconsider if you’re doing the best thing for the animals by having 3 or more cats. If you don’t have room enough to give them their own territory to use the bathroom in, do you really have enough room to support healthy living for the animals themselves? I know we love our cats, and its a hard question to ask yourself because you’re attached and its easy to feel like you’re being attacked, but honestly consider if its best for the animals. If they don’t have room, they can’t get away and have “alone time”, they have to share their resources with a bunch of other cats, are they really going to be happy and healthy? Take all of these things into account when you get a pet cat. Now if you already have cats, I am in no way saying you should give up your babies, or that you’re a bad pet parent. You are should not, and you are not. But consider finding ways to give them more room and privacy if you think they need it. And I promise they’ll enjoy having more litter boxes around, and so will you! What is the best litter box to use? As far as type of litter boxes go, we recommend the Breeze Litter System. We have tried dozens of litter boxes and the Breeze System is hands down the most effective at trapping odors. It is completely dust free, with clay pellets that are safe for your baby. There is a pad underneath to trap urine and eliminate the odor, and not only do the pellets make for easy clean up, but they are specially formulated to trap odors and they don’t stale! We love our Breeze Litter System! If you’re wondering how many litter boxes you should have for your cats, I hope this little guide helps you! Great advice … especially about taking into account whether you can provide a decent standard of living for each cat – regardless of your own desires and wants. A lot of people don’t seem to consider that. They want to talk about how all life is precious, but don’t consider the stressful living environment they’re creating for their cat. No one wants cats in shelters or on the street, but it’s arguably better to provide a great life for one or two cats, than a poor life for a dozen. Thanks for the post. I found the info very helpful. I have five cats and six litter boxes. Thank you for this post. It is really useful for cat owners. I had cats but frankly I had not ever known how many little box would be enough for them. thanks for your useful tips. Honestly, I have never thought of how many boxes are enough for my kitties. Now my kitties will have comfy shelters and I could save money too. Thank you for this helpful post! Now I think I should go and buy some extra litter boxes. Yes you do! You need 3 more litter boxes!